Food is the great connector. Communities that have the resources to feed themselves are more resilient, healthier, and foster better relationships to each other and to the land. Food is one of our human commonalities, an easily shared delight, and a necessity in our day. Culturally appropriate nourishment is what we must strive for. We need a food system that does not seek to exploit soil health, worker and farmer rights, the wider environment or the ability to access healthy food. As eaters and farmers across our region realise the benefits of agroecologies, eating nutritious food, localisation, solidarity economies and food justice the alternative food systems continues to gain in momentum and in importance. Against this backdrop, another international CSA network has evolved in the South Pacific to serve and develop a growing food movement. 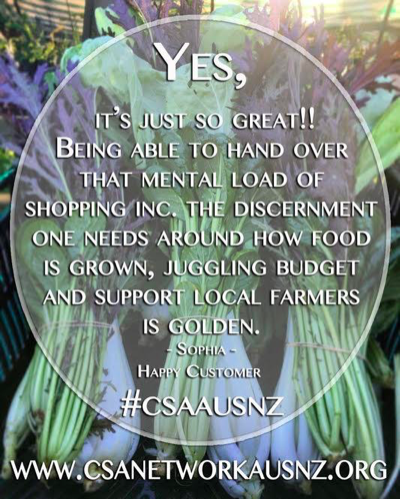 The Community Supported Agriculture Network Australia and New Zealand (CSAAUSNZ) is an advocacy group dedicated to highlighting, growing and supporting CSAs in Australia and New Zealand. 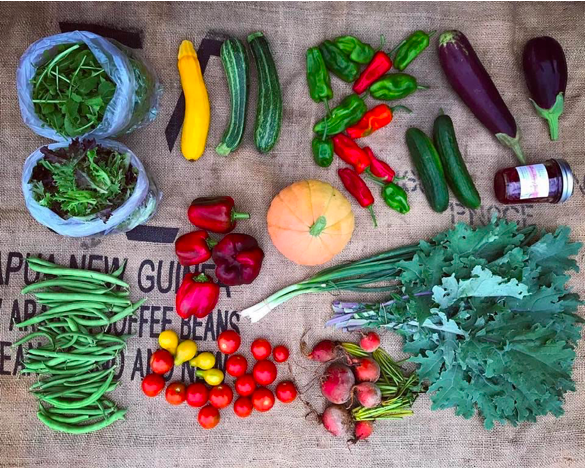 Born out of a Facebook group and then a website and directory, CSAAUSNZ was established in March 2018 as a need was identified for an organisation to provide a focus for the development of Community Supported Agriculture in the region. With the many wonderful farmers out there championing CSA in their respective regions we can imagine a strength and vitality that can achieve by working together. See the establishment of Participatory Guarantee System (PGS) to run alongside CSAs. To date, we have added 30 farms from Australia and New Zealand onto the Directory. Many farmers have since reported an increase in enquiries for CSA shares in their farm, with our mapping on the website working well and clearly being utilised by the general public, eaters and farmers alike. The network aims to facilitate a space for farmers and eaters to share and explore complimentary direct distribution models to align and identify with Community Supported Agriculture and to seek solidarity in experiences. There is much going on in the background, as we connect farmers in their respective areas, forge important links and the sharing of knowledge. We are also able to help eaters get in touch with farmers for that important connection to food, its supply, and the true cost that should accompany it. The network has had excellent media coverage in its first few months, with a feature article in The Australian Newspaper, a widely-disseminated radio story on ABC National Radio, an article in Victoria’s CWA News and a great many social media posts discussing CSAs and what the Network can achieve into the future.